Bernard Raymond Bercik, 85, of Moon Twp., Passed away on Sunday, January 27, 2019. He was born in Donora, PA on February 23, 1933 the son of the late Julia & Peter J. Bercik. His American dream began by playing football at Donora High School and by receiving many football scholarships, among them one to Georgetown University. There he met Jacqueline Daley, now his beloved wife of 62 years. He was commissioned as Second Lieutenant in the United States Air Force, served on active duty for three years, in the Reserves for 13 years and was discharged as Captain. He graduated from Georgetown Law School in 1961, practiced law in Pittsburgh, founded Merrit Development, Inc., and established himself as a commercial and residential real estate developer throughout Allegheny County. His company survives him and his loyal employees continue to manage his properties. Bernard was preceded in death in 1960 by an infant daughter, their third child. 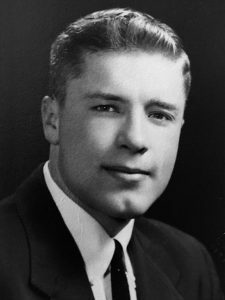 He is survived by his wife Jacqueline, his children, Bernard J. Bercik (Mary Lynne), Michael J. Bercik, Judith A. Bercik, Mary Elizabeth Leonard, Barbara McConnell (Todd), his beloved grandchildren, Katherine Glusica, Elizabeth Rugh (David), Robert L. Leonard III (Anna), Jacqueline Dobies (Justin), Julia Neel (John), Alberta Leonard, Caroline McConnell, Bernard R. Bercik, John Paul Bercik and 10 cherished great-grandchildren. Also survived by a sister, Mary Ann Finotti, brothers Peter J. Bercik (Peggy), Richard C. Bercik (Verna) and many nieces & nephews. Family wishes to thank those who helped care for him, foremost Lynne McCullough and his son Michael, Melissa Kanfoush and the staff at West Hills Rehabilitation and Nursing Home. In lieu of flowers the family suggests donations to the Felician Sisters of Our Lady of the Sacred Heart Convent in Coraopolis, and St. Margaret Mary Church, Moon Twp. and The Salvation Army. There will be no public viewing. Mass of Christian Burial will be on Saturday February 2, (Everyone please meet in the back of the church beginning at 9:00 AM), Mass will start at 9:30 AM in St. Margaret Mary Church, Moon Twp. Bernard will be interred in Arlington National Cemetery, Washington D.C., at a later date.